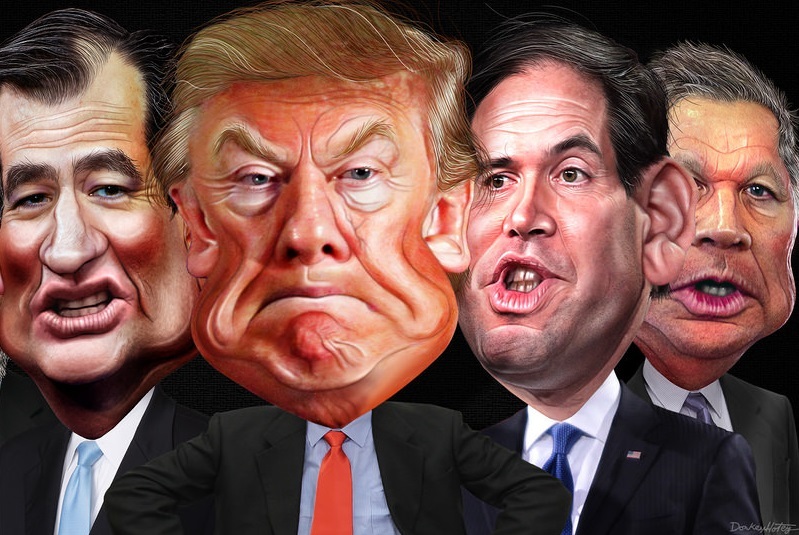 Much of considerable materiality has occurred since the last Republican debate on Feb. 25. Super Tuesday has come and gone, with Trump doing well, if not as devastatingly well as his supporters had hoped and worried pundits and Republicans had feared. Marco Rubio (full disclosure: this writer’s choice in the current field for about a year) has descended as far as Trump in implicit comments about the size of his male organ. No one had anticipated this low order of campaign rhetoric from anyone but Trump. Prior to Thursday’s debate, a last ditch rhetorical effort to “stop Trump” was issued through a speech by the 2012 standard bearer of the Republicans, former Massachusetts Gov. Mitt Romney. He warned that “if we Republicans choose Donald Trump as our nominee” that America would experience “a prolonged recession” and would have a dishonest phony and fraud who is so amateurish at foreign policy as to endanger the United States. John McCain added his disrespect for Trump. For the debate on Fox News, the candidates were now down to four: Trump, Gov. John Kasich, Sen. Marco Rubio and Sen. Ted Cruz. The debate started out by Chris Wallace’s asking Trump about Romney’s remarks. Trump said again that Romney was a failed candidate, yet another ad hominem answer, the history of which has not hurt him with the Trump faithful. Trump completely disavowed the Ku Klux Klan and David Duke and said that he had said the same thing on Twitter, falsely implying that he had never equivocated on even knowing who Duke was or evaluating the worth of white supremacy groups. The raucous crowd interrupted at each opportunity, adding nothing to the debate, and their noisiness was disproportionate to their size and was randomly distributed. Cruz said the thing to focus on was not on how well he did on Super Tuesday but on how he was going to reverse the malefactions of President Obama. Trump responded that he was way ahead of Cruz, and that Cruz’s support was embarrassingly low. Kasich averred that he defeated Hillary Clinton in polls more than any other candidate, while Trump claimed that it was in only one poll. Rubio was asked about Trump and job creation, by Chris Wallace: “How many jobs have you created?” Rubio claimed the question was irrelevant and attacked Trump on the validity of his job creation claims. Trump answered with his characteristically childish reference to “this little guy” in reference to Rubio, and then he repeatedly disparagingly called Rubio “Little Marco,” perhaps encouraging 12 year-olds that they too could even today participate in presidential debates. Kasich would periodically intone that he was the experienced, responsible candidate, and his examples and arguments were convincing, but he avoided any criticisms of Trump and may have just seemed too milquetoast to most 2016 Republican voters. Asked about foreign policy and his accusations against Trump’s lack of preparation and amateurism, Rubio reiterated that Trump doesn’t even understand the vagaries of this complex world. Trump responded unresponsively again that Rubio wasn’t a leader and that we need to support our veterans. Rubio responded with more accusations of a naive Trump. Megyn Kelly asked Trump about his contradictions, illustrated on tape, and Trump said you have to have a degree of flexibility. Trump’s attitude toward Kelly was seriously attenuated from their prior encounter. She went over the history of Trump University and the suits Trump has encountered. Trump claimed that the litigation will eventually vindicate him, and Rubio claimed it was a scam, to which Trump responded that Rubio has been an absentee senator. Do you see the relevance of that riposte? Of course not. When Cruz adds to charges relating to Trump’s economic irresponsibility, Trump goes into a peroration on how little support Cruz has. Then Cruz responds that polls show he and not Trump could beat Hillary Clinton. Asked if the candidates would support the nominee of the party, all, including Trump, said yes. The debate Thursday night wasn’t filled with comity, but it was less divisive than many would have predicted, perhaps because we have become used to consistent personal shots in these debates. As for the outcome of the debate, it cannot be certain what effect Thursday’s events — the Romney speech, the McCain echo and the debate — will have on the primary season. Still, it appears that Trump’s supporters are immovable. Richard Vatz teaches political rhetoric at Towson University and is author of The Only Authentic Book of Persuasion.